This is the second installment in the series of blog posts called, It’s All About Morale. As I shared in the previous post, a school administrator must make staff morale a primary area of his/her job responsibilities if their school is going to move forward. In the corporate world, business leaders can motivate staff with incentives ranging from bonuses to threats of job loss. That is, if a leader of a company needs to get his/her workers to work harder or do something “extra,” all the leader had to do is offer some kind of monetary incentive, and the work will get done. If an employee is not complying with the leader’s request, the boss can threaten to end that person’s employment, and thus provide a different kind of incentive. In education, however, we don’t have such options. Administrators can’t give monetary bonuses, nor can he/she threaten to fire a teacher who chooses not to get on board with a new educational program. I know you know this. The difference between education and the corporate world, however, is that teachers, for the most part, are not motivated solely by money, so you can’t really use money or the threat of not having a job as an incentive. I believe the vast majority of teachers chose this profession to make a difference in the world with their lives. They want to change society. They are givers, and doing “extra,” if it is in alignment with their purpose in life, is not too much to ask. You see this “change-the-world” attitude often in new teachers. They are so willing to do anything that is asked of them, because their focus in still on their purpose in life. As teachers spend more time in the profession, that enthusiasm can be dimmed by all of the demands placed on them every day. Add the other distractions, such as conflicts with co-workers, lack of support from parents, and unappreciative administrators, and it’s no wonder why up to 30% of our teachers today are burned out. (Give and Take – Adam Grant). It’s up to us as school administrators to keep that first-year-save-the-world enthusiasm strong, not only in our new teachers, but especially in our more experienced teachers. How can we do this, Sam? The first step that we need to take as school administrators can be summed up in the phrase that I’ve adopted as my guiding statement. This two-letter-ten-word statement says it all. Before there can be any change in the morale of my school, I need to realize that I’m the one responsible. It’s up to me. I can’t wait for someone else to change. I can’t wait for that teacher to retire. When I’m in the middle of a negative situation, I have to stop and ask myself what did I do – or not do – to cause this problem? For example, I had scheduled an assembly in the multipurpose room, which also serves as the gym, and when the time came to set up for the assembly, the PE teachers got upset, because they had plans for the use of the gym and were unaware of the assembly. I know I had told them in an email about a month ago. I could have even gone back and shown them the proof. It would be easy for me to blame the PE teachers for not reading their email or placing the assembly on their calendar. I was right – technically. At that moment, because of the conflict in schedules, our morale took a hit. They were upset, because they felt neglected and not important enough to consult about the assembly, and I was frustrated, because I felt that they didn’t pay attention to my initial email. That’s when I remembered my guiding statement – If it is to be, it is up to me. What I’ve learned is, that as leader, I need to ask myself what was my role in the situation. Yes, I sent the email. Yes, it was on the calendar. Where I failed, however, was that I didn’t communicate enough. I could have sent the teachers a follow up reminder email. I could have confirmed with the PE teachers a couple of days before. So, instead of getting upset and further lowering the morale, I chose to apologize and recognize my role in the confusion. They were able to take a step back and realize that they missed an email, and we worked it out. They were awesome, and I made sure I thanked them for their willingness to sacrifice their lesson plan to make the assembly happen. 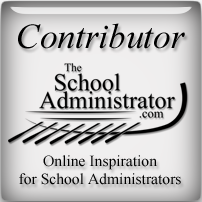 The bottom line, and the most important lesson to take away from this blog post, is that improving morale at our schools is our responsibility as school administrators. We are the defenders of school morale. We can’t wait till others change. We can’t wait until that teacher retires. We can’t wait for circumstances to change. Once we’ve taken on that role of defender of school morale, then it’s time to cultivate that save-the-world attitude among all our teachers. I’ll share some ideas on how to do that in my next blog post. Don’t forget to sign up to be notified by email when it’s posted. Until then, here’s to your journey toward School Administration Mastery!